February 5th, 2017 (8:16 PM). Edited March 4th, 2017 by Joexv. I got bored and made this. Its a simple program that runs in the background while you're working on your hacks and will make backups for you. Now you wont have to worry about not having a backup when you mess up! 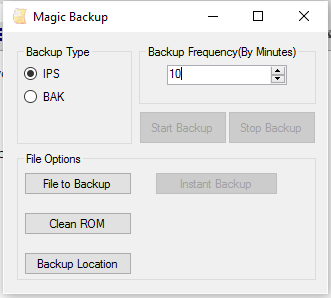 "C:\ProgramData\MagicBackup" just so you know. February 6th, 2017 (12:46 AM). It will save time for those hackers like me who often encounter an bug and somtimes even have to restart the hacking process due to lack of backups. February 13th, 2017 (12:57 PM). February 13th, 2017 (6:49 PM). That's a really cool idea. Definitely worth a download. March 4th, 2017 (1:38 PM). June 7th, 2017 (1:19 AM). Looks and sounds great! just what I needed! thanks man! June 7th, 2017 (1:49 AM). Definitely cool! Ill give it a try. Im sure that this tools would be really useful for hackers!